Under an agreement between the park and the states surrounding Yellowstone - Montana, Wyoming and Idaho - hundreds of straying bison can be killed each year through slaughter and regulated hunting. The practice has inflamed bison advocates like the Buffalo Field Campaign and some members of tribes in Montana and the Pacific Northwest. In a sign of tribal dissent surrounding the issue, other members of the same tribes annually exercise treaty rights to hunt bison that migrate to Montana from Yellowstone. St. Goddard's position on bison was not formally sanctioned by the Blackfeet Nation, leaders said. The number of culled bison so far this year is more than 330, with most loaded on trucks and sent to slaughter. Bison managers are seeking to cull 1300 of the animals from a herd estimated at 5,500. 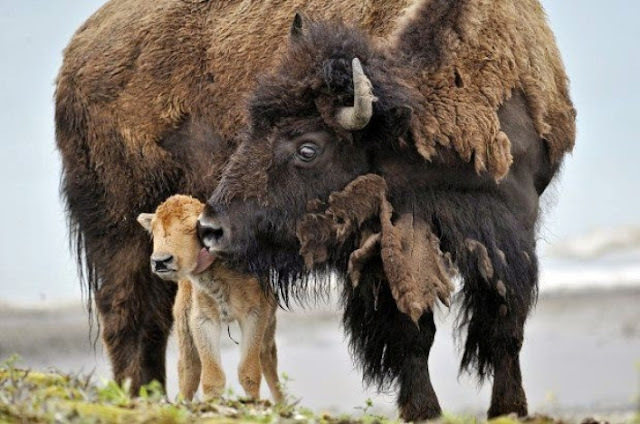 "This is a new beginning to protect the bison and other wildlife in Indian country," Jimmy St. Goddard, a self-described spiritual leader of the Blackfeet Tribe in Montana, said in a telephone interview from outside the Montana Capitol in Helena. He was among dozens who gathered to call for an end to the slaughter of Yellowstone buffalo, which are a major attraction for the 3 million people who visit the park. They are the largest purebred herd of wild buffalo in the United States. Responses to "Native Americans gather in Montana to protest slaughter of Yellowstone bison"
Good for them.the buffalo should not be killed.its disgusting.